If you're a parent and you haven't heard of The Wonder Weeks, listen up. When Ford was 5 weeks old and we hit a road bump. We happened to be across the country at The Influence Conference and Ford would not sleep. Sure he was only 5 weeks old so I wasn't expecting him to sleep through the night but we were on a great routine and there was a chink in the armor. If he was awake, he was crying or wanting to nurse, and the only way he'd sleep is in our arms. Oye. I shared more about the weekend here. What we soon realized is that he was going through his first developmental leap, charted by The Wonder Weeks. If you read one book or follow one parenting phenomenon, let it be The Wonder Weeks. Basically research has been done and your baby goes through fussy phases every few weeks because their little brains are growing and learning. Everything is tied to this developmental growth (patterns, sensations, relationships, etc.). It is so interesting and has always been spot on for Ford. The Wonder Weeks leaps are on and off until babies are 18 months old and Ford would start his leaps on the exact estimated day (based on their gestational age). Knowing what was going on in his little brain didn't make the crabbiness and clingy-ness easier, it just helps calm me down knowing there is a reason for it. It's actually really neat to know what your baby is learning (you can read about the leaps here). What's been a little frightening having baby #2 is starting over. We are back to square one with leaps, I know that 4 month sleep regression blows, and teething scares the crap out of me. But I am prepared. I know that the long nights of non stop cluster feeding and baby soothing WILL end. That is the biggest blessing that comes with second time motherhood. I am able to savor more moments rather than shaking my fists in frustration and take each day as it comes. There will be a time where both of my babies drift peacefully off to sleep from 7p-7a. It will happen! So here we are at the beginning of Lucy's very first leap and I am incredibly exhausted and I'm not gonna lie, there are moments during the day where I have to swallow tears because I can't calm her down but I am encouraged knowing that this isn't permanent. One way I stay sane through leaps is baby wearing! When little sis wants to be held and comforted, I simply can't just sit on the couch with her (I wish I would have known how easy the first baby was when you had the luxury to sit on the couch for 10 hours!). I need both hands to wrangle Ford and thanks to baby wearing, that is possible. I've loved wearing her in wraps (the Solly is my current favorite) but we just got the LilleBaby and I am really liking it so far! We got the 6-in-1 complete LilleBaby that allows us to wear her (or Ford) 6 different ways. We had an Ergo with Ford and weren't able to wear him forward facing and I think he would have really liked it! I am wearing Lucy facing me in the newborn hold right now but I am excited that the LilleBaby allows her to face forward in a way that is safe for her hips and easy on mama's back. I know Jon and I will be baby wearing a lot this summer during outings, pool trips, and vacations and I think he is going to love wearing her in the LilleBaby because it is made of breathable mesh. One of his biggest complaints about baby wearing is that he sweats like a pig which isn't enjoyable for him or baby. The 3d mesh fabric allows for air circulation keeping baby and parent cool! I am so happy to add the LilleBaby to our baby wearing collection and love that we can wear our tiny baby girl in it along with our big chunky toddler. The back support is amazing on the Lillebaby! A lot more than my Ergo or any of my wraps. This will be really nice when we wear Ford or as Lucy gets bigger. Lucy may have gotten some dinner on her head while she was snoozing away :). 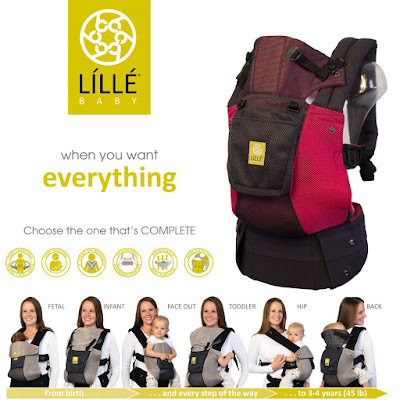 Buy your 6-in-1 Complete LilleBaby here. I like how baby can be worn in so many different ways in this carrier! I have to remember this one for when I am pregnant! Yes, yes yes yes to the Wonder Weeks! I downloaded the app and was so thankful for it as Charlie grows. You're right that it doesn't make the nights shorter or the cluster feeding less irritating but it does help to know there's a REASON for it and you're not doing something wrong. We have the Ergo and noticed our son's legs would get a little purple sometimes. Did that happen to y'all? And did this carrier do that too or did it give them more support? Ruthie, if you had to do it over again would you have gotten the Ergo 360 that allows forward facing? I'm currently debating between the Ergo original and the 360. The only thing I worry about with the 360 is the waist band is Velcro, rather than a clasp and that could get annoying. Any insight?